An ready made paste for instant use. 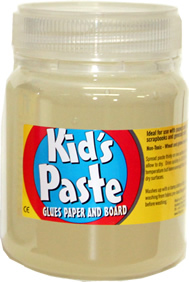 Kid’s FAS paste is safe, non-toxic and wheat and gluten free glue, great for use with paper, card, papier mache, scrapbooks and general crafts. 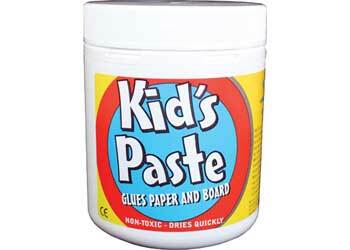 The paste dries quickly with no offensive odour and is safe and easy to be used by children. The plastic tub is easy to open and the wide opening allows the children to access the right amount of paste required minimising mess and wastage. Children can easily apply the paste to a number of different surfaces and as it dries quickly you can use the glue to stick a number of layers on top of each other. The paste also dries transparent so it will not interfere with the colours the children have used in their crafting. This comes with no lumps to deliver a smooth consistency and will break down with water meaning it will wash out of clothes it comes into contact with. It can also be used to extend paints for crafting and painting.